Otherwise and colloquially known as Punchbowl Cemetery, the National Memorial Cemetery of the Pacific is a United States Armed Forces cemetery in Honolulu, Hawaii. Part of the National Register of Historic Places, the cemetery gathers millions of visitors every year, making it one of the most popular tourist attractions in all of Hawaii. It is dedicated to Army, Navy, Marine Corps, Air Force and Coast Guard members who lost their lives in their line of duty. The location of the cemetery wasn’t the fruit of coincidence; it is located on what Hawaiians called “Hill of Sacrifice,” which used to be an altar where they offered human sacrifices to pagan gods and where they installed a battery of two cannons used to salute prominent arrivals and signify noteworthy instances. Since the site was established in 1949, approximately 53,000 World War I, World War II, Korean War and Vietnam War veterans and their dependents have been interred in these grounds – including the sadly infamous USS Arizona victims during the Pearl Harbor attack. In addition to its vast burial grounds, the cemetery contains a number of small memorials, such as that of Honolulu, commemorating soldiers of 20th-century wars. The memorial is often regarded as the highlight of the cemetery’s visit, because of Lady Columbia’s statue erected at the top of the staircase in the Court of Honor; also known as Lady Liberty or Lady Justice, she is said to represent all grieving mothers. The National Memorial Cemetery of the Pacific is located at 2177 Puowaina Drive in central Honolulu and is open daily from 8am to 5:30pm between September 30 and March 1. It is open from 8am to 6:30pm between March 2 and September 29. On Memorial Day, the cemetery is open from 7am until 7pm. Combine visits to three of Oahu's important landmarks, each honoring significant events in American history: the National Memorial Cemetery of the Pacific, the Battleship Missouri, and the USS Arizona Memorial. Skip-the-line access, lunch and a 35-minute guided tour of the Battleship Missouri are included. This 9.5-hour tour includes transportation in between the three sites, in addition to a tour of downtown Honolulu. Combine visits to the Pacific Historic Park, Punchbowl, and downtown Honolulu on this deluxe 9.5-hour tour. Hit all the important historic sites, including the Pacific Aviation Museum, the USS Battleship Missouri, the USS Bowfin, and the USS Arizona Memorial, with skip-the-line tickets and reserved shuttle and movie times. Lunch and round-trip hotel transportation included. See Oahu’s historic sites and scenic highlights on a full-day trip from Kauai that includes Pearl Harbor, Honolulu and the National Memorial Cemetery of the Pacific at Punchbowl. Travel through the poignant WWII-era history of the Hawaiian Islands, from the 1941 attack on the USS Arizona to the 1945 armistice signing aboard the USS Missouri. Get a glimpse of Oahu’s royal and colonial past in downtown Honolulu then reflect on aisles of gravestones and the heartrending “courts of the missing,” a remarkable memorial to soldiers lost in the war. Discover Oahu’s top attractions on a 5-hour guided tour of Pearl Harbor and downtown Honolulu. Led by a local guide, you’ll visit the USS Arizona Memorial and learn the history behind the infamous attack on Pearl Harbor. Then, head through downtown to see the King Kamehameha Statue, the State Capitol and the Iolani Palace, the only royal residence on American soil. Transported by air-conditioned coach, you’ll experience the best of the island on this comprehensive adventure. Explore downtown Honolulu and other landmarks and natural wonders on a private tour. Adjust the day’s itinerary to suit your interests, and make sure you don’t miss top sights on your list. See Iolani Palace and the iconic golden King Kamehameha statue. Get local insights and recommendations from your driver. Avoid the stress of driving, navigating, parking, and public transportation and travel in a luxury chauffeured vehicle. 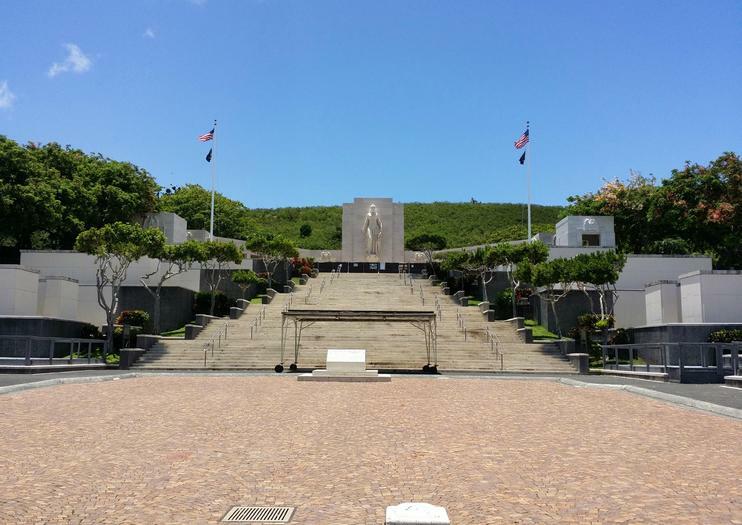 Combine visits to three of Oahu's important landmarks, each honoring significant events in American history: the National Memorial Cemetery of the Pacific, the Battleship Missouri, and the USS Arizona Memorial. This 8-hour tour allows you to see all three sites, with transportation in between, in addition to a tour of downtown Honolulu. Pickup and drop-off at selected hotels included.